Europe has taken on near mythical status for many American techno and house followers, a continent full of clubs, record shops, festivals, and most importantly people who are dedicated to that faithful, four to the floor beat. Knowing that this dance music Mecca looms across the Atlantic, many American fans find their own cities lacking and yearn to live the 24/7 techno lifestyle. Speaking In Code examines Europe’s allure through an unclouded lens, praising its acceptance of the form while acknowledging the drawbacks as well. Flitting between Berlin, Barcelona, Amsterdam, Cologne and Jena, its quick pacing imitates the “economy jet-set” experience. Through interviews with a handful of artists such as Modeselektor, the Wighnomy Brothers, Robert Henke, several members of the Kompakt family, and Ellen Allien, Grill gets a sense of what life is like for techno’s upper echelon. She accompanies the two members Modeselektor on a trip to visit their mothers, who prove quite supportive of their sons’ quirky music and are even shown dancing at one of their gigs, and watches as they play to 20,000 people at the “After Dark” portion of the Sónar festival. The film depicts how labels like Kompakt and Freude Am Tanzen take a communal approach to creating, developing, marketing and selling music — their core artists and employees live together and treat each other as a sort of family — “a small communism” in the words of Gabor Schablitzki (aka Robag Wruhme, one half of the Wighnomy Brothers). In interviews with ranking dance music critic Philip Sherburne and Day, Grill’s then husband, each espouses the perception that Europe is dance music’s promised land, with the former opting to move to Barcelona for its club culture and the latter shown marveling at Kompakt’s in-house record shop, wishing aloud to be a part of that lifestyle. Even Grill’s many filming trips to Europe, framed as an escape from problems at home and the paltry Boston techno scene, paint Europe as an idyllic beacon for dance music’s obsessed masses. The continent’s many positives come into stark relief with Day’s intrepid if fraught attempts to raise electronic dance music’s profile in Boston. At his then-day job as label manager/marketing director for Massachussets-based record distributor Forced Exposure, his cheerleading for house and techno records meant increased access to esoteric dance music for many American consumers. But Day’s devotion to the genre only begins at work; refusing to wait around for his favorite artists to announce a Boston date, he books his own shows and organizes local parties financed with a mounting tide of credit card debt. Day’s devotion and willingness to risk his own skin is shared with many promoters across the U.S., but few clubbers grasp all the blood, sweat, tears and dollars that are poured into each big event and Speaking In Code offers vivid examples of how they play out. Modeselektor, who are accustomed to playing to thousands, are drafted to play the comically named Enormous Room in Cambridge on what appear to be studio monitors. Despite filling the room to capacity, Day walks away from the event eating $700 in losses, sustained only by the cheerful energy overflowing the club’s confines. Later, he and Grill take over a friend’s large loft space and turn it into Boston’s hotspot for electronic dance music parties. But after weeks full of after parties and other events, the sQuareone loft is shut down because of “complications” with the building’s owners. It’s only then that Day pulls back on the reigns and realizes how unsustainable his ambitions have become. But despite outsiders’ rosy perceptions of Europe’s electronic dance music scene, the reality is not all it’s cracked up to be. Few who crave the opportunity to spend every waking moment in a club or record shop can grapple with what unlimited access is like in practice. Speaking In Code illuminates this truth best in how it covers Gabor Schablitzki and the Jena-based Freude Am Tanzen collective. When visiting the studio part of their compound, the usually jester-like Schablitzki admits to trouble with his girlfriend and grows sullen. Grit Sachse, one of FAT’s long time members, explains how their Jena home base provides their artists some much needed isolation from the partying scene, adding that Schablitzki has grown increasingly picky about his gigs in order to preserve his energy and enthusiasm. Not long after, he decides to deal with the intensifying pressure of popularity by withdrawing completely from touring, leaving the other Wighnomy Brother, Sören Bodner, to go it alone. When Grill interviews Kompakt’s Tobias Thomas, he begins by expressing his love for DJing and the dance music culture in which he’s intertwined, but concedes that the question of whether the motivation, the energy or the nerves are there to deal with the nightlife is never too far from his mind. Viewed alongside Day’s relentless drive to build an American answer to Europe’s 24/7 club culture, it becomes clear that having too much of a good thing is indeed possible, and it’s not necessarily clear that’s the case until you’re in deep. As an American techno/house obsessive who often fantasizes about escaping America’s frustrating dearth of dance music culture for Europe’s many splendors, I could empathize with Sherburne, Day and Grill’s drive to more fully belong in a way their homeland couldn’t provide. And I especially appreciated that Grill did not sugarcoat artists’ experiences within that same idealized scene. Speaking In Code successfully personalizes the realities of music obsession, from packed stadium triumphs to tribulations that require self-sacrifice in pursuit of satisfaction. 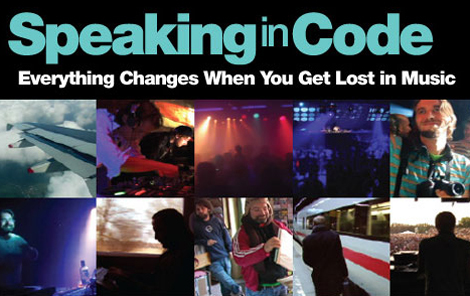 Speaking In Code is available on DVD March 12th. Check out a deleted scene from Speaking In Code featuring Bryan Kasenic of Beyond Booking. Our thanks to David Day and Amy Grill for offering us this clip. Below that we have Baltimoroder’s SiC podcast #1, featuring tracks from the documentary. So glad to see this review up here. This movie means a lot to myself and many loved ones, and I’m happy that the rest of the world has the opportunity to see it now. Congratulations to everyone that was a part of its creation! nice writeup Steve, some great insights I hadn’t thought of, some nine months after seeing the film. also funny to see Enormous Room mentioned on LWE… maybe not perfect for modeselektor, but such a cozy Cambridge spot… Sarah and I have some very dear DJ memories from that place. About Jena Freude am tanzen / musik Krauze team: What they ve been doing there, the way they organise it, and the good electronic music education they ve been giving to the people there, is absolutely awesome. I had the chance to play there few times and i know a bunch of these guys and girls, I wish it was like this everywhere! Will, Boston misses you! Don’t be too homesick though! I’m really feeling this review, thanks!